It was a year we won’t soon forget. In 2016 we launched this very site, became entrepreneurs, and joined #vanlife. We’ve clocked thousands and thousands of kilometres across Canada from east to west, touching eight of the ten provinces along the way, and through five states to where we’re currently resting in Arizona. It’s been one heck of a ride. To celebrate the year that was, here’s our Best of 2016, all of which we experienced on the road—the best camping, dive bars, coffee shops, running routes, and more. We love this stuff so hard, we hope to do it all again in 2017, and think you should, too. We’ve camped in a lot of epic places this year, and were hard pressed to pick just one. Living Forest on Vancouver Island is on the water, and each site is surrounded by soaring trees. On the other side of the country in Nova Scotia is Meat Cove, which is a more open concept campground that sits on the most northern point of the province. We woke up to the sound of the ocean and fishing boats trolling in the cove each morning. While Big Bad John’s has resided in its current location for several decades, it’s also undergone many facelifts. Currently, it’s got a cool saloon vibe. Baskets of peanuts—yes, you can toss the shells on the floor—kept us happy as we sipped our pints of IPA, and we watched the tender who served us cut off a couple of overly drunk patrons (which is an admirable quality in any bar staff). Who doesn’t love a dive bar with a sweet patio. The Rhino in Toronto is perfect for crushing beers with friends, or pulling out your laptop and hammering out some work. Coleman’s mom and sister run this community-filled spot in Merritt, BC, and it’s seriously the best place in town for a hot drink and a muffuletta sandwich… and a cup of mulligatawny soup… and a sticky bun (granny’s original recipe). Brambles Bakery& Cafe was pretty much the closest thing we had to a paid sponsor this year, feeding us (several times) daily. Fairmont Pacific Rim, Vancouver, BC. We’ve got a real soft spot for the Fairmont Pacific Rim in Vancouver. We’d go so far as to call it our favourite temporary home in the whole country. We love the huge huge soaker tubs that overlook the city (we recommend the harbour view), and the live music in the lobby bar, which is the perfect place for a cocktail or two and to get a slice of what it is to be a Vancouverite. We spent Christmas Stateside at The Cosmopolitan in Las Vegas, so its sultry opulence is still fresh in our minds. The one-bedroom suite we lived in on the 47th floor overlook the Strip, and we felt immediately at home—in a weird Vegas sort of way—for the holidays. Maybe it’s because we were on a high of having just started our adventure, but we loved everything about Fredericton. Adorable cafes, a great waterfront with designated running and biking trails, funky bars and shops, and some of the loveliest people in the country. Coleman’s home province FTW. Thing is, BC has so much to offer. There’s the costal wonderfulness on VI (Tofino, Nanaimo, Victoria), Vancouver’s city lights, and vibrant interior towns like Nelson, Invermere, and Golden. Also, the mountains, and the slow, but stunning drives through ’em. We’d never given this southwestern state much thought, but it’s a playground for outdoor adventure. Not to mention the nature and the landscapes here change in a blink of an eye. From the red rocks in Sedona to the Saguaro-filled parks in Tucson, the Montezuma ruins, and the kitschy ghost towns like Jerome and Nothing, you could spend months exploring this state. Okay, maybe it’s not the best, or most life changing piece of content we’ve ever written, but it was one of the most fun to to put together. We made the gifs for the story in Tofino on one of the randomly sunny mornings we had. 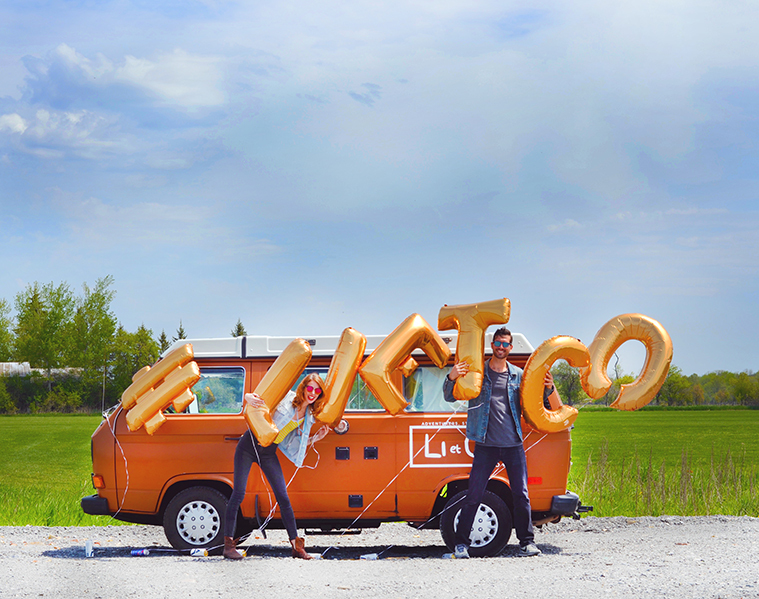 In June, were in Almonte for Bus Fusion, Canada’s largest VW bus festival, and ended up having the most delightful jaunt through the picturesque town, and over and across several of its bridges. But our run in Calgary’s Fish Creek Park was also pretty epic. The sprawling trails are so close to the city, and we got to see all kinds of marshy nature. We fell in lust with La Jolla, outside of San Diego. Running through the neighbourhood streets of multi-million dollar homes that dot the ocean became a daily ritual, and stretching on the beach afterwards was just as rewarding. Summertime in the Canadian prairies is like being inside of an oil painting. It’s gorgeous. But the mosquitoes make it near impossible to fully enjoy the beauty. We took this photo above, for example, in seconds, and then ran back to the safety of the van. In Northwestern Ontario, we met a bear. Just a black bear, but still a bear with its paws up on the side of our rig, sniffing through the windows. While it left us shaking at the time, it made for a good story. Not only is Victoria’s thrifting scene thriving, but the business owners put a lot of work into curating their selection of treasures. Thanks for making 2016 a year to remember! We look forward to making 2017 another winner with you all. Follow along on Instagram, Twitter, and/or Facebook and, as always, reach out with any questions, concerns, or just to say hi. We love hearing from you.